The beautiful Red Eyed Tree Frog is on of the most sought after of the hybrid frogs! The Red Eyed Tree Frog Agalychnis callidryas is one of the most popular pet frogs. It has a light green body with blue banding on the sides, interspersed with white, though it can change its color to blend in with the substrate. However, its most notable characteristic are the bright red eyes that its common name is derived from. Another common name, though less frequently used, is the Red Eyed Leap Frog. These cute frogs are not hard to keep as long as their needs are met. They become active at night and are thus awake when the family is home from school and work. They are funny frogs, always fascinating to watch, but it is especially exciting to witness their color changes. They turn from shades of light green to dark brown, matching their surrounding environment, when they are hunting. The Red Eyed Tree Frog is an excellent pet frog for beginners and experienced frog owners alike. They were first imported prior to the middle or late 1980s, generally from Honduras. There are suspected to be more than one species, possibly up to three, though the genetic research is pending. The Red Eyed Tree Frog Agalychnis callidryas was first described by Cope in 1862. 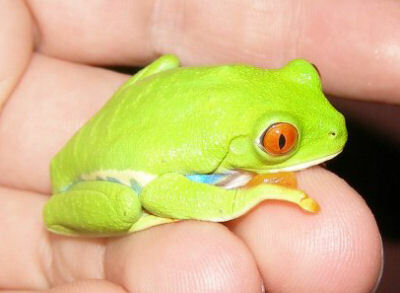 The Red Eyed Tree Frogs are found naturally from Central America to Mexico, most notably in Honduras. They are native to Belize, Colombia, Costa Rica, Guatemala, Honduras, Mexico, Nicaragua, and Panama. They live in tropical forests and move from tree to tree, staying somewhat low to the ground, where they return every night to hunt. They will almost always be found near a water source. Other common names they are known by include Red-eyed Treefrog, Red Eyed Leap Frog, and Red-eyed Leapfrog. The Agalychnis callidryas is on the IUCN Red List for Endangered Species as Least Concern (LC). The Red Eyed Tree Frog is generally considered to be an abundant species. The most striking characteristic of the Red Eyed Tree Frog is obviously their red eyes. The body is a light green in color with blue banding on the sides, interspersed with white. The feet are generally yellowish. They may sometimes have white dorsal spotting. The females are the larger of the species, reaching up to 3" (7.6 cm) while the largest size for a male is 2 ¼ inches (5.7 cm). Crickets and house flies are two of the best foods for the Red Eyed Tree Frog. Crickets should be fed a ‘gut load' diet, readily available at most pet stores. This gives the cricket, and in turn your frog, a better diet with more vitamins, minerals, and calcium. Red Eyed Tree Frogs are sensitive to calcium and Vitamin D3 deficiencies, so these should be provided in powder form by dusting the crickets with a powdered mixture of 1/3 calcium and 2/3 vitamin powder every third or fourth time they are fed. The smallest suggested enclosure size for a single frog or a pair of Red Eyed Tree Frogs is a twenty gallon ‘tall' aquarium. These frogs are arboreal, or tree-dwelling, and need the height rather than the length in an enclosure. Orchid bark or a coconut-fiber based substrate work best. Ventilation is also important for the frogs and balancing ventilation and humidity can be complicated. You can cover part of the screen top with plastic wrap, or cover part of the top with a thin towel. Some handy keepers have even mounted a small computer fan on top of their tree frog enclosures to introduce a steady airflow into the cage. These frogs enjoy many plants, vines, and limbs to climb on, as their natural environment is a forest. Some common plants that would readily be accepted by your frog are Philodendron, peace lilies, Pothos, prayer-plants, Sanseveria species, and bromeliads. These should be kept in their own pots buried in the substrate. Climbing branches at suitable widths (the width of your frog's body or larger) should be available at your local pet store. If you wish to provide lighting for your frog, a fluorescent light will be best. Fluorescent lighting will help to set a day/night schedule as well as to help with calcium absorption and UV exposure, though it is currently under debate as to whether these frogs need the exposure or not. The substrate should be kept damp and the cage should be misted three times a week. The humidity in the cage should be kept between 30 to 50% during the non-breeding season. If trying to create breeding conditions, you can raise the humidity to 80%, but constant exposure to this high humidity can result in health complications for your frog. These frogs do well in temperatures between 65° to 85° F, though specimens kept at either extreme for suspended lengths of time can suffer health problems. It is best to keep the temperature at a happy medium of 70° to 75° F.
If your house is particularly cool, a low wattage (20 to 40-watt) daytime bulb can be useful, though a thermometer should be used to monitor the average temperature of the cage to make sure it does not get too hot. Some incandescent bulbs can heat up a glass enclosure very quickly and dangerously. Heat also lessens humidity as the water evaporates, so you may need to mist more often with a heat bulb in use. Any and all water provided for your frog should have chlorine and chloramines removed. Both of these chemicals are often used in local water treatments. You can use a dechlorinator or purchase purified or distilled water. Some dedicated frog keepers have even set up home RO systems (reverse osmosis) to provide purified water for their frogs. Water should be provided in a bowl for your frog. The water bowl needs to be cleaned daily, as that is where the bulk of the urination and defecation will occur. Any other feces should be scooped out or scraped from the glass daily. The cage should be misted two to three times a week, depending on the relative humidity of the cage. This is easily determined by keeping a humidity reader in the cage. These frogs do well alone, in pairs, or in colonies. They get along well with each other and provided the cage is large enough, there will be no aggression problems. For more than two frogs, a 55-gallon tank is recommended. You can go with a different size tank (such as a hexagon), as it will provide more height, which is an essential factor for these tree frogs. Red Eyed Tree Frogs become active mainly at night. They will climb down to the bottom of the cage to get time by the water bowl and also to hunt. Sometimes, the frog will change its color to blend in with the substrate to aide in hunting, turning a dark brown. These tree frogs do not normally jump, preferring a hand over hand motion of moving. However, their leaps can be quite large if they are startled. It is always better to handle your new frog over its cage until you know how it will react to your presence. As these animals absorb substances through their skin, it is vitally important that you wash your hands before and after handling the frog, for its own safety and for yours. If you wish to initiate breeding, you should first have a pair, male and female. Only the males vocalize, so that along with the size difference of the sexes, is an easy way separate the sexes. Raise the average humidity and make sure that there are plenty of leaves available DIRECTLY OVER a water source, rather large in area. The leaves should be no more than two to four inches above the water source. The female, once approached by the male, will deposit her eggs in a gelatinous substance on the underside of a leaf over the water source. The male will then fertilize the eggs. Once the eggs mature, the tadpoles will wriggle out of the egg sac and fall directly into the water. The clutches can contain between 20 to 75 eggs, depending on the size and age of the female. A female can deposit up to three or four clutches of eggs in a single night. Temperatures should be kept between 78° to 85° F for ideal hatching, which occurs between five and eleven days. The tadpole stage lasts between 40 to 60 days. It is critical that the water is kept clean, aerated, and that the tadpoles are offered food in the form of flake fish food, soaked leaves, and live aquarium algae and moss. Once the tadpoles metamorphose to the froglet stage, they will have an insatiable appetite. You should feed them wingless fruit flies and pinhead crickets on a high calcium gut load and dusted with calcium powder every other feeding, as they are prone to MBD (metabolic bone disease) at this stage. Along with many other frogs, Red Eyed Tree Frogs are highly prone to metabolic bone disease. It is particularly important that you gut-load their feeders with a mixed, high-quality diet and that the feeder insects are lightly dusted with a calcium and vitamin powder every other feeding. These frogs are readily available at many pet stores. Depending on the size and age, they can range in price between $20 and $50. You might consider putting a red or black reptile nightime lamp (sold in pet stores) on the cage in the evening so your daughters can see them. The light from these lamps is not visible to the frogs, but will illuminate the interior to allow you to see the frogs. I've been trying to look online to see if there are places to buy plants from but I don't want to have the possibilities for having fertilizer or unhealthy stuff in the plants for my frog. So I'm curious if anyone knows personally of a site online that sells the type of plants my frog likes that are also safe for my frog. Choose broad leaf varieties of plant that can support the weight of the frog. Some suggestions include snake plants (Sansevieria), many bromeliads, pothos ivy, some philodendrons, Japanese evergreen, java moss, Anthurium, Mongtera species and creeping figs. Remember, plants will require a full spectrum bulb for growth. The Red-Eye Tree Frog does not require any special lighting, so make sure you provide hiding or shade spots in your enclosure. I'm 12 and I really want a red eye tree frog they are soo cute, but idk how to get one so if any one knows where to get one please reply. You could start by checking to see if any local pet stores carry them. If they do not, ask them if they could special order one for you. You can order them online! Thru the mail! That's how I got mine when I was 14. It may seem cruel but how do you think pet stores get them? Yep, that's right, through the mail! By the way they are usually captive bred babies so they don't know the difference and you get them the second morning after you order them. Example: If you order them Monday you will get them Wednesday about 10:30am. I recommend getting them at reptilesncritters.com because they are born in captivity on that site. Not taken from the wild. There they are $40.00 for adults and $30.00 for babies...plus about $35.00 for shipping.